On the Bab is a Korean street food restaurant and takeaway. A place for casual dining where typical Korean drinks and popular dishes can be enjoyed together in a Korean tradition known as “anju”. On one particularly raininy Sunday evening, I met my friend Joe at On the Bab. We were meant to be doing a tour of Chinatown on that day, but as plans sometimes do, it went a bit squiffy and we ended up having to choose an alternative venue. Enter On the Bab. It was Joe’s suggestion – he fancied Korean and neither of us had tried it, but had passed with intrigue a few times. “You know a good Korean restaurant when most of the clientele is Korean”, said Joe as I sat down in my seat. I agreed as I looked around and saw a restaurant full of smiling Koreans, all seemingly enjoying their dinner and soju cocktails. The menu is split into sections – Smalls Plates, On the Bab, Traditional, Korean Anju for Drinks, Special / Comfort – plus a range of sides. I wanted to try one of everything, but realised this might be a bit much. Instead, we ordered a Bibimbab and portions of the bulgogi beef and vegetable fritter buns. We also ordered a small glass of traditional Korean soju each. Soju, for those who don’t know, is a distilled beverage containing ethanol and water – doesn’t sound good, but tastes great. I think the waitress forgot our order as the table next to us received their food despite sitting down way after we did, but once it arrived, the conversation dried up as we devoured the dishes. The vegetable fritter buns were my favourite – really delicious pillowy steamed bun filled with crispy vegetable fritter and fresh herbs. The food may not have been as memorable as my meal at Gogi (wow, that was good), but for a casual dining experince in Shoreditch, it does what it says on the tin. Dishes range from £3.60 – £11.90. Sides from £2. Soju cocktails £7 and glasses start from £3. This place looks great. I need to pay a visit. It was delicious! 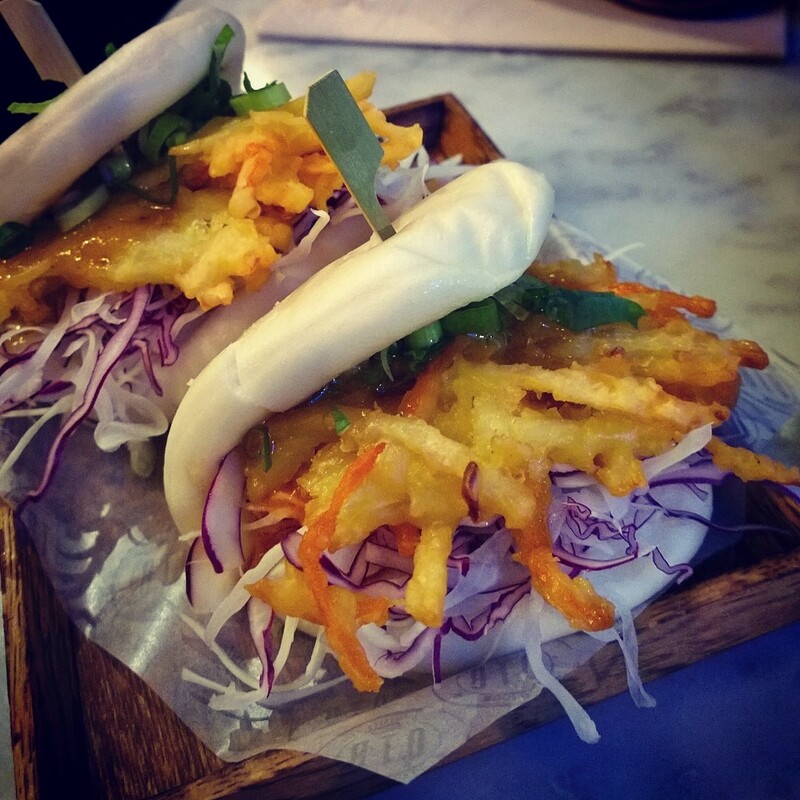 The vegetable fritter bun was the best thing we ordered! Let me know how you get on if you make it.